AgfaPhoto has introduced its 3-in-one DV-5580Z camcorder. Besides functioning as a camcorder, the DV-5580Z can also be a camera and sound recorder. It is suitable to bring along for a vacation. You can record the local traditional performance into a video; take the photos at attractive sceneries and sound record your daily trip experiences and feeling. The AgfaPhoto’s DV-5580Z is a compact and lightweight camcorder. Its weight is at 160g with approximate dimensions of 12cm x 6cm. It is able to record high resolution video up to 1440 x 1080 pixels with 30 frames per second in MPEG4 format. It has a 2.5” TFT LCD display screen to view your video as well as the images. The DV-5580Z is able to take still images up to 8-megapixels in JPEG format. It also features a 5x optical zoom and 4x digital zoom. The camcorder is equipped with the technology of Digital Image Stabilisation function to reduce blurring. Besides that, the outfitted video light on the camcorder allows shooting in low light conditions such as dark interiors. There are nine different programs such as automatic, portrait, night, sports, landscape, sunrise, beach/snow, spotlight and manual for users to choose from. You can view your video direct from your home HD TV or PC with the given AV cable or USB cable respectively. The power is supplied by a rechargeable lithium-ion battery with a high energy density characteristic. The file can be saved into SD or SDHC memory cards with a capacity up to 8GB. 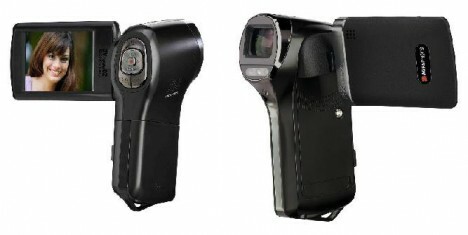 The AgfaPhoto DV-5580Z will be available in March 09 at $249.95.